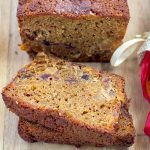 Delicious spiced cake with Fireball-soaked fruits. Cut dried fruits into small pieces. All pieces should be about the size of raisins. Place fruit in a dish that can be covered with an airtight seal, like a Pyrex dish. Using a microplane, top the fruit with zest of lemon and orange. Pour in Fireball whiskey. Mix well, then press fruit down so that they’re all submerged. Cover with airtight seal and leave at room temperature overnight. If need be, you can microwave them for 5 minutes – but it’s not the same. Add whiskey-soaked fruit to pot, along with butter, sugar, apple cider, and spices. Bring up to a boil, then reduce heat and simmer for 10 minutes – stirring frequently. Then remove from heat and allow to cool completely, or at least 20 minutes. Add all dry ingredients to mixing bowl – flour, salt, baking soda, and baking powder. Mix together with a whisk. Using a fine mesh strainer (or a sifter, if you have one), pour dry ingredients into strainer and sift into wet ingredients. Using a rubber spatula, mix together all ingredients. Once fully combined, add and mix eggs one at a time until fully incorporated. Spray a 10-inch loaf pan with nonstick cooking spray. Pour batter into loaf pan and bake for one hour in an oven preheated to 325 degrees. Check with a toothpick. If it comes out clean, it’s done. If not, cook and check every 10 minutes. Then remove and allow to cool completely before removing from pan. You may need to use a knife to help release from edges, then very carefully turn out cake. It’s very moist and fragile.